The local inhabitants of Lombok are called Sasaks, they speak Indonesian as well as their local Sasak language. The other main ethnicity’s include Balinese, Chinese, Arabian and Javanese. Lombok has three main districts with three capital cities: Mataram in the west, Praya in central and Selong in east Lombok, the majority of commerce is in the capital city of Mataram in west Lombok. The majority of the population on Lombok are Muslims, every Friday around 12.00 noon Muslims go to the mosques just like Christians go to Church on Sunday. Therefore, on that day, most businesses and government offices are closed for half of the day and then re-open again after praying (not including Senggigi). If you are planning on travelling around the island and visiting small villages it is more respectable to wear slacks or knee length shorts, a shirt with sleeves or a sarong. If you happen to be here during Ramadhan, which is the Muslim month of fasting from sunrise to sunset, please do not eat, drink or smoke in public during this month long fast. Even though the people don’t seem to be offended in the common tourist areas like, Senggigi and the Gili islands, it is better to respect the people and their beliefs. 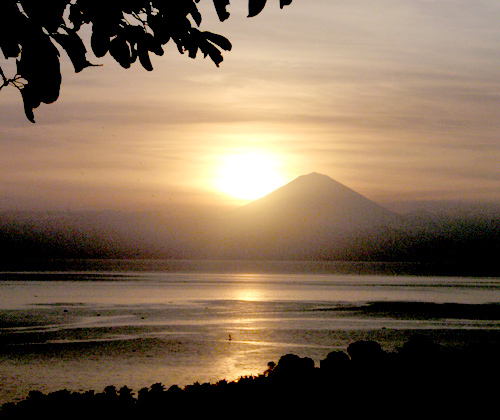 The island of Lombok is located east of Bali. Tourism is not quite as developed as Bali which makes Lombok the perfect getaway. Escape to the picturesque mountainside, enjoy the beautiful landscapes or experience the white sandy beaches of Lombok and the Gili Islands. Lombok is the perfect place to relax and unwind from daily life. The off-peak season in Lombok extends from November to May and the peak season runs between May and October. The ideal time to visit Lombok is May when the weather is just perfect with bright daylight and green scenery. Don’t miss Lombok’s beautiful scenery, if you choose to rent cars or motorcycles and drive yourself you must have an International Driving License. Remember if you collide with anything, or it collides with you, you may be responsible for all costs therefore travel insurance is always recommended. Renting a car is a good alternative, either self driving or with a driver so that you can relax and enjoy the view. It is normal to tip your driver pocket money for meals if you stop for lunch or dinner. Motorcycles are a convenient and inexpensive way to get around the island but tourists are frequently injured in motorbike accidents. If you rent a bike drive slowly and very defensively, helmets are required by law but those provided by rental agencies offer little protection. If you are pleased with the service a respectable tip is Rp 20,000 minimum. Imaj Private Villas … Imajine everything in life was this perfect.